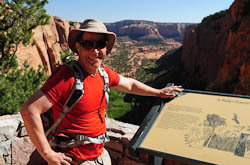 “You could go to Arches, Canyonlands, Mesa Verde and even Hovenweep and Navajo,” my big brother James suggested. We scanned a map of the southwest while I took notes. I suddenly needed an alternative vacation plan since our regular September cabin-closing time at McCall was out. We’d just hired Builder Brian to construct a new bathroom for our little Idaho cabin and he said he could do the project in September-early October. “Before the snow,” he explained. Poor Jim (as in husband, not brother.) He’d been trapped in the Salem-Portland area for months due to a work project. While it’s hard to beat a Willamette Valley summer, my sweetie was getting cabin fever, and our remodel threw a wrench in our cabin vacation. So sitting around our cabin table, Brother James and I developed a substitute travel plan. What Jean learned: Listen to your big brother for a trip like this, especially if he’s a former archaeologist. I scheduled a short layover at the Salt Lake City airport. How far could one Delta gate be from another? Two concourses away, it turns out. We ran, arriving ten minutes before the gate shut. 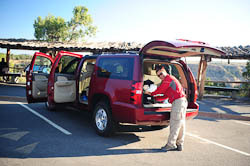 And that’s how we ended up with a mammoth red Suburban for eight days. What Jean learned: Schedule longer than 41 minutes between flights, no matter the circumstances. 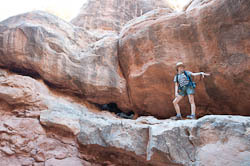 On the Park Service website for Arches National Park, you’ll find cautionary alerts about their popular but intense “Fiery Furnace” hiking tour. Sometimes people exaggerate, we thought. How hard could it be, we figured. 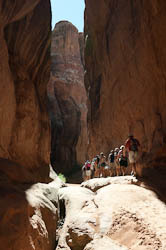 We scheduled two days at Arches, and began with the Fiery Furnace tour. You need a Park Ranger guide because the tour is tricky and folks tend to get lost in the maze of massive fin-shaped rocks. I’d asked Jim if he wanted to do this three-hour hike. “Absolutely,” he answered. Kate had us scamper in and out of rock pits—going fast for necessary momentum. We jumped across a four-foot wide gap (“the long jump,” she said.) 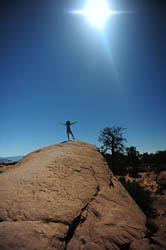 We used upper-body strength to pull ourselves onto shoulder-high boulders. We hugged trails on narrow ledges. 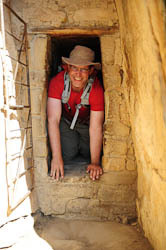 Inside the soaring, narrow crevice walls, we could either: a) crab-walk, b) place rear on one wall and legs on the other, or c) incorporate a little of both (my choice.) 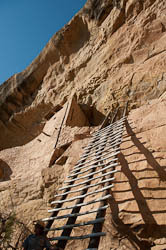 A fall in the crevice risked injury; a fall from the steep ledges risked worse. 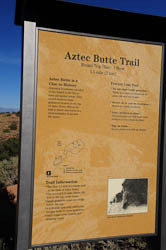 A retiree named Bill--an experienced hiker--had left his wife, Sue, at the trailhead. “I’ll cash in your life insurance if you don’t return,” I heard her joke as we left. Later I watched as Bill slipped in the crab-walk crevice, severely spraining his ankle. He couldn’t continue. 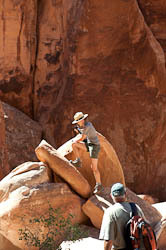 This occurred in the “deepest, most dangerous part of the Fiery Furnace,” according to a ranger I spoke with later. Kate had to leave us behind to gain radio coverage for the rescue call. Our group huddled in a rocky alcove. We were Lost, marooned on our three-hour tour. I hoped that young Ranger Kate would return. 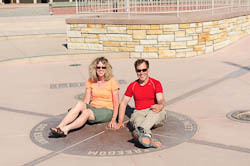 Among our group were three good-natured buddies who’d traveled the world together for thirty years. They clearly had some type of medical training, but were cagey as to exactly what. “Don’t ask, don’t tell,” they laughed while bandaging Bill’s ankle, elevating his foot, and digging into Kate’s bag for emergency ice packs. But they’d stayed at a Holiday Inn Express the night before, they said—seriously. These men were effective at keeping Bill calm and reassured and the general mood light. Later we heard they were concerned about Bill’s blood pressure and the possibility of shock. Kate returned. Halleluiah. 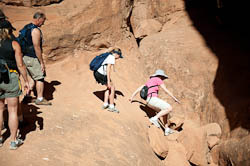 The Holiday Inn Express trio agreed to stay with Bill while Kate guided the rest of us from the Fiery Furnace. She detoured to hidden arches on our exit since it would “take a while for the rescuers to arrive” and for her to lead them back to Bill. Apparently Arches had triggered other injuries that afternoon—a broken leg and a seizure. Off-duty park rangers got emergency calls to report. 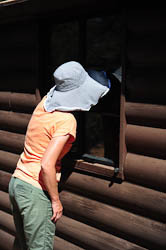 Lesson for Jean: I hope to remain as active and vivacious as those retirees on our tour, but I think I’ll skip the Fiery Furnace when I reach their age. 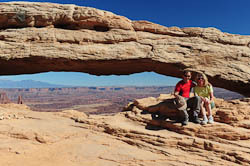 We’d sandwiched Canyonlands between our two days at Arches. On a map, the parks look close, but practically, they’re a good fifty mile journey. 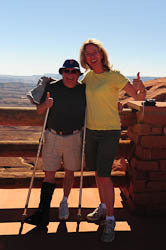 At a drive-up view point, we spotted a familiar-looking man with crutches and a boot-cast. Could that be…Bill? Yes, it was! We chatted with Bill and Sue and learned the details of his rescue. Other Canyonland visitors leaned in to hear his story. It had taken fifteen rescuers five hours to deliver Bill from the Furnace. They strapped him into a gurney and attached ropes at each corner. Rescuers climbed high atop both sides of the parallel fin walls, dangling Bill in the fissure below, moving him one foot at a time. In the narrowest parts, they turned Bill sideways. “Was it scary?” I asked. 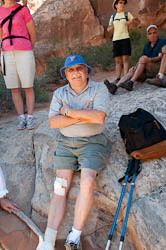 Bill faced six weeks of ankle recovery and was bummed to cut short his hiking on this trip. 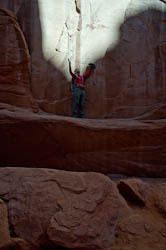 Yet he intended to return to Arches next year--and planned another attempt at the Fiery Furnace. We exchanged e-mail addresses and Facebook names. I want to hear how it goes for Bill next October. What Jean learned: Wear sunscreen. And sometimes I can do more than I think. On the highway into Hovenweep, we encountered sheep and goats and sheepdogs that gazed at our Suburban as if saying, “You ARE gonna stop, right?” Wild horses roamed the open range. (Yes, they exist.) 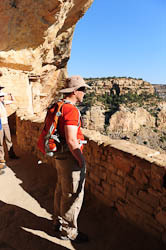 The desert isolation of Hovenweep contributes to its preservation and untouched beauty. 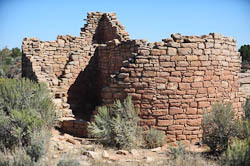 Ancient Indian tribes constructed Hovenweep, a series of sophisticated rock structures, way back in 1,200 A.D. Jim was amazed by the intricacies of the stone work built on cliffs surrounding the canyon’s edge. The peoples’ talents extended to agriculture, and they successfully grew crops in this harsh environment. 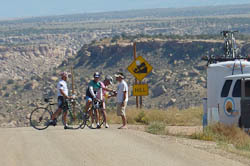 We never encountered bikers on the trail, but we did meet an elderly couple from Oklahoma. (We’re senior magnets, it seems.) The husband used a cane and the wife wore braces on both legs, but they steadily reached most of the park’s landmarks. 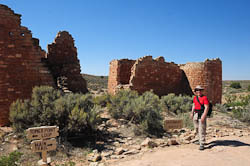 They’d visited Hovenweep multiple times, he said. 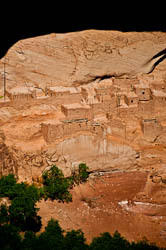 They were inspired by how the ancient peoples worked hard to build such a thriving community, one that still stands. “Coming here makes me want to do better in life,” the wife said. What Jean learned: Don’t be judgmental. You’ll be there someday, too—if you’re fortunate. Furthermore, I don’t care much for spandex-wearing male bikers. 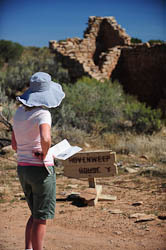 From Hovenweep, we drove the thickest line on the map to Kayenta, Arizona. 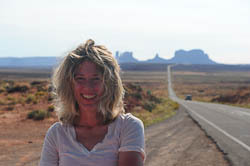 We were supposed to pass through Monument Valley en route, but somehow we missed it. Could a person drive thought Monument Valley-- and fail to see it? We realized our (my) error and detoured back up the scenic road. 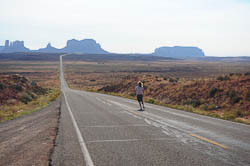 At Monument Valley, I hopped from the Suburban, waited for traffic to ease, and trotted down the center of the highway, like Forrest Gump. Afterwards Jim noticed other travelers following my example. What Jean learned: Study maps better. Sometimes the better road is the wrong road. We liked these smaller monuments, away from the busloads of English, German, and French retirees we’d encountered at Arches and Canyonlands. “This group hails from the Champagne region,” one bus driver at Arches clarified for me. 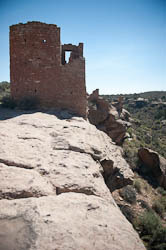 Ranger Kate had mentioned that in late summer, 80% of Arches’ visitors were German and French senior citizens. To our ears, Russians took up several more percentage points. 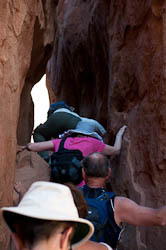 But most foreigners stuck to their buses and viewpoints—not places like the Fiery Furnace. Or Navajo National Monument. What Jean learned: Sometimes we go overboard with political correctness. You’ve seen photos of these cool Indian dwellings carved into cliffs, but likely didn’t know where to find them. 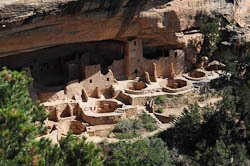 They’re here, at Mesa Verde. We drove to Cliff House for our up-close, ranger-led tour. The parking lot buzzed with fire trucks and an ambulance. “We had a near fatality,” Ranger Dennis told me later. An older gentleman had collapsed in Cliff House and was now flying by rescue helicopter to Durango, Colorado. 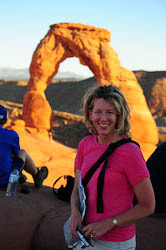 Later I told Ranger Dennis how young Ranger Kate forgot to safety-talk us before the Fiery Furnace hike at Arches. “She’ll learn in time,” he responded. Maybe she already has, I thought to myself. 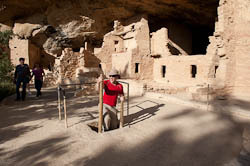 On our second Mesa Verde day, we signed up for another ranger-led cliff dwelling tour. 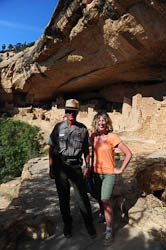 Ranger Ellen’s voice chimed at a high octave; she could pass for a middle school kid playing park ranger dress-up. But Ranger Ellen packed power, and we soon realized she owned a snarky side, which kept us in line on our journey to Balcony House. 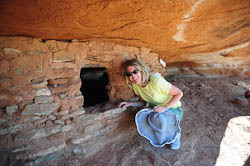 Balcony House had an 800-year-old retaining wall, which like Ranger Ellen, might be easy to underestimate. She reminded us not to sit on the rock wall, a temptation since it appears so sturdy and new. 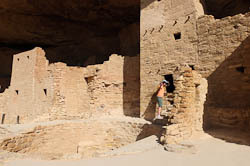 The wall remains intact partly due to its sheltering cliff overhang, and partly due to the expert construction of the Puebloans. “Pueblo toddlers weren’t much different than toddlers today,” Kate said, pointing to the stone wall. 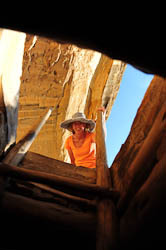 “The tribe needed the wall to keep their babies from falling off the cliff.” On our way out, we crawled through a tunnel then up a 32-foot ladder. And we considered: Do we build anything today that lasts 800 years? What Jim learned: The Southwest is a full decade behind in espresso drinks. You’re hard-pressed to find a decaf vanilla latte anywhere. They have decaf, and they have vanilla, but a decaf vanilla latte befuddles them. “We can’t do that,” they’d say. Nourish creativity, curiosity and enthusiasm for life. 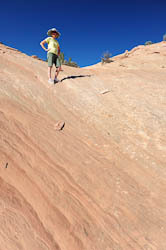 Measure your limitations, hike out to meet them, but don’t push beyond the edge of the cliff. With a sturdy foundation and a reasonable amount of coverage (sunscreen, rocky overhangs), it’s possible to age gracefully and weather well.